Presenters Mel and Sue with judges Mary Berry and Paul Hollywood. Bake Off presenters Mel and Sue have said they will not be presenting the series anymore, when it moves to Channel 4. The Great British Bake Off series will be moving to Channel 4, after the BBC lost the contract with the company who make the hit programme. The show was first broadcast on the BBC six years ago, and since then there have been seven series of the show. Mel and Sue have been the main presenters for all seven series of the popular baking show. 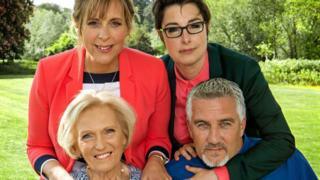 They said: "We were very shocked and saddened to learn yesterday evening that Bake Off will be moving from its home. We made no secret of our desire for the show to remain where it was." Love Productions who make the series have said: "We would like to thank Mel and Sue for bringing their own unique humour to the tent over the past years and we respect their decision not to be part of the Bake Off team on Channel 4." It is unknown whether judges Mary Berry and Paul Hollywood will also be leaving. However this news means that there will be brand new presenters when the series starts again on Channel 4.